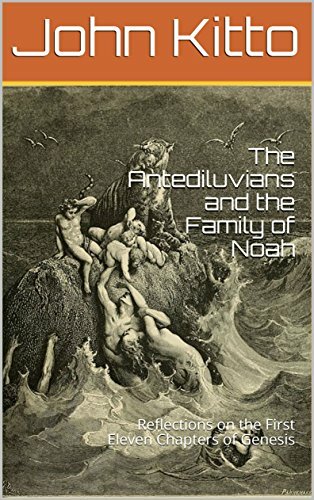 The main body of the present work—with minor revisions—is taken from the first volume of John Kitto’s Daily Bible Illustrations, and gives an interesting insight into the history of the antediluvian peoples. Of the more than 20 books Dr. Kitto had written, the celebrated British preacher, Charles Haddon Spurgeon, claimed that his 8-volume Daily Bible Illustrations were "more interesting than any novel that was ever written, and as instructive as the heaviest theology.” That John Kitto’s works should ever have been published, much less highly acclaimed, is a testimony not only to his perseverance and moral character, but to the gracious providence of a merciful God as well. Many authors are remembered, not for their lives, but for their works. Their personality is lost, and they are known by what they have achieved, not by what they have been. But this silent separation of the author from his works cannot happen in the case of Dr. Kitto, whose name is now immortally associated with biblical study and literature. For the measure of his success is not more amazing in its amount than in the means by which he reached it. His life is as instructive as are his labors; and the two combined, present an unequalled picture of triumph over obstacles which have been very rarely so surmounted, and over circumstances which few have ventured to encounter, and which fewer still have mastered to such advantage. He did not merely neutralize the adverse position of his earlier years, but he wrung from it the lessons and habits which slowly built up his fame, as they prepared him for his ultimate achievements.